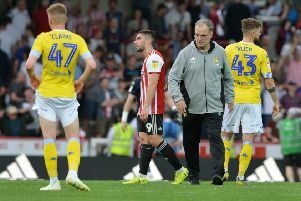 Leeds United head coach Marcelo Bielsa enhanced his legend status with an extraordinary press conference at Thorp Arch in which he unveiled the amazing lengths he goes to, to find out as much information as he can on opponents. Following the attention the club has been getting over the admission that a member of Bielsa’s staff was sent to Derby County’s training ground ahead of the game last Friday the head coach called a sudden press conference and once again took full responsibility. He went further, saying that he had every team that Leeds have played so far this season watched, but it was ‘not illegal’ and he did not have “bad intentions”. Bielsa said: “I am going to try and explain that I didn’t have bad intentions or get a sporting advantage. I did it because it was not illegal or violating a specific law. Of course I have a point of view but it does not mean mine is right. “As Lampard said he doesn’t believe I didn’t have bad intentions. He believes that I violated the fair play spirit. “So I have to adapt to the rules that are linked to the habits of English football. We have to respect the procedures. “In my job I am overexposed and I don’t like being in the media too much but I think it is important to make this explanation. “When you look at the opponent you are looking for specific information. You want to know the starting XI and the strategic set-up and their set-pieces. “Those are three key things head coaches analyse. When you watch a training session from an opponent you get this information a day before a game. Obviously it’s not information that can allow you to build a project to neutralise the opponent during a game. Aided by a power point presentation the Leeds boss went on to illustrate just how much detail he has at his disposal to analyse before matches. He continued: “The league after a complaint made by Derby County decided to open an investigation over my behaviour so they will evaluate if I behaved bad. “One point I would like to talk about is that I am going to make it easy for the investigation of the league. I will give them what they need. “I assume the fact that my behaviour is observed. I observed all the rivals and we watched all the training sessions of the opponents before we played against them. “My goal is to make the investigation easier. I don’t think this will make it worse what they’re looking for than what I am saying right now. By doing that I assume the possible sanctions they will give me. “I don’t want to compare my behaviour with the past. I’ve heard that there are other behaviours that effect the fair play but I absolutely do not want to defend myself by attacking others. I don’t want to point to any other situation that is not linked to my responsibility. Bielsa added: “All the information I need to clarify the game against an opponent I gather it without having the necessity without having to watch the training session of the opponent. So why did I do it? It’s just because I thought I wasn’t violating a normal thing. As I reach my conclusion. I gather information that I can obtain in another manner. I would like to explain how the brain of a head coach works. “Apart from the players in the staff you have around 20 people. These 20 people create a volume of information. It’s absolutely not necessary. It doesn’t define the path of the competition. So why do we do that? Because we feel guilty if we don’t work enough. Bielsa went on to illustrate all the information he had on Derby before last Friday’s game. He explained: “Of each opponent we watched all the games of 2018-19 - we watched the 51 games of Derby County. To the journalists assembled Bielsa demonstrated in matches picked out by them how Derby lined up and the tactics they employed, going into detail about how this information was analysed. “I might not be able to speak English but I can speak about the 24 teams of the Championship,” he said. “I feel ashamed to have to have shown you all this. On United’s next opponents Stoke City, Bielsa said that because Nathan Jones recently took over as manager he and his staff had been analysing all of the games involving Jones’s previous club, Luton.